The South African satellite industry had the opportunity to showcase their inventions at the South African Innovation Summit (SAIS) organized by the Department of Trade and Industry (the dti) in Cape Town that was in session from September 12 to 14. The SCS Space company, a subsidiary of the Somerset West-based SCS Aerospace Group, displayed some of their satellite hardware at the event. This included a Gecko Imager (similar to their one orbiting Earth in their nSight-1 satellite for the past 18 months) and the Chameleon Imager (the next generation satellite imager with 10 meter ground resolution in 120 spectral bands). SCS Space also acts as the coordinator of the Department of Trade and Industry’s program called THRIP (Technology and Human Resources for Industry Program) to support applied research between industry and academic institutions. Some 12 students and researchers are supported through this program to do research on advances in nano-satellite engineering at various universities including Nelson Mandela Metropolitan University, Stellenbosch University and Cape Peninsula University of Technology. On the industry side, the space imaging advances and a new power system is contributed by the Space Advisory Company. 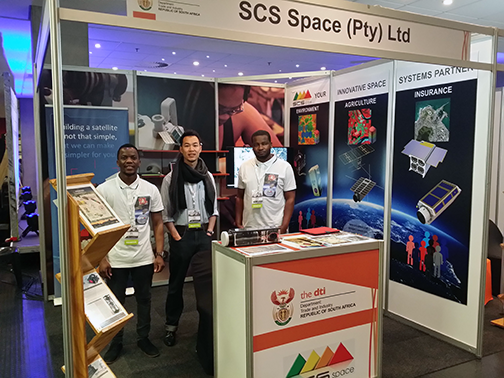 SCS Space employers Lordwick Rikhotso, Louis Feng and Musa Nkuna at the South African Innovation Summit (SAIS). According to a release by the African News Agency, the dti contingent was accompanied by 30 black industrialists who would participate in the CEO’s forum hosted by SAIS for the purpose of exposure to potential technologies that will prepare them for the new digital industrial revolution. Trade and Industry Minister Rob Davies said that the South African innovation summit is an annual flagship event on the South African innovation calendar that fosters, develops and showcases African innovation, as well as facilitates innovation thought-leadership. Davies said that the innovation summit concept was created purposely to support and promote innovation and facilitate collaboration within its own eco-system. The initiative brings together corporations, thought leaders, inventors, entrepreneurs, academia and policymakers to amplify South Africa’s renowned competitive edge and to inspire sustained economic growth across the continent of Africa.